Spring Lakes Golf Club (4962 Stouffville Road, Stouffville). 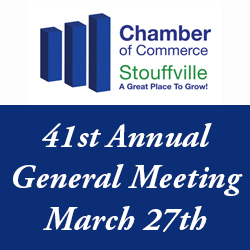 At this year Annual General Meeting - We will review what we have accomplished over the past year, the financial report and Members will be electing candidates for (2) two positions that will need to be filled on the Board of Directors due to vacancies and succession planning. We invite and encourage all Members to attend this no-cost meeting.